Happy Wednesday friends! 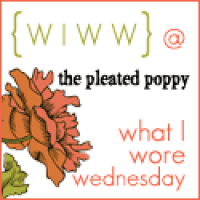 Today, I decided to link up with The Pleated Poppy for her What I Wore Wednesday link up party to share with all of you what I have been wearing this Fall. You all know all about my love for Jane.com so I am sure it would not be too surprising to hear most of my items featured are from that amazing website. Here is a close up of the necklace, I absolutely love this piece, it easily dresses up every Fall outfit. What about you? What are you wearing? What's your favorite Fall go-to? I would love to know. Found you from the link up. I've got a similar utility vest and I love wearing it this Fall. I purchase compression leggings in many colors. The raisin and heather charcoal have the same feel and weight as the black ones. A thicker cotton feel. I did find the raisin to be a tad bit larger and seemed to have more stretch.